It is with great excitement we welcome all Trojans back to our beautiful campus and provide a time for you to reunite with your fellow classmates during our 2016 Homecoming. HLGU classes of 1966, 1976, 1986, 1996 and 2006 – you will be our honored guests at Homecoming 2016! We hope you will begin making plans to attend September 30 – October 2! This will be an event you won’t want to miss! Homecoming is the time of year for Trojans to return to their roots, and we are looking forward to honoring the class of 1966. Their 50 year class reunion will leave each of us with a better sense of the tradition and pride that goes hand-in-hand with being alumni of this great university. Friday’s highlights include the alumni golf classic, The President’s Reception, and Banquet. On Saturday, come visit the alumni tent where we’ll have food for purchase and a place to sit and catch up with fellow alumni before watching our soccer teams. Were you an HLGU athlete? If so, we have alumni games for you to participate in! Children will enjoy performances by HLGU’s The New Edition and a bounce house. You are then invited to worship with us on Sunday during a special chapel service led by HLGU’s Praise Song, special music by HLGU’s Chamber Choir, and message by Dr. Anthony Allen in Parker Theatre at the Roland Fine Arts Center at 10:30 a.m. This is your opportunity to end our great weekend with inspiration from the Word. There are many more exciting activities happening during Homecoming. Mark your calendar, call your classmates, and make plans to come and have a great Homecoming at HLGU! Hannibal-LaGrange University recognized the annual alumni award winners during the 2016 Homecoming Entertainment on Friday, September 30. The three awards were given to Mervin Sharkey ’63, Gilberto Romero Contreras ’08, and Judge Holly J. Henze ’81, ’98. The Outstanding Service Award was presented to Mervin Sharkey ’63. 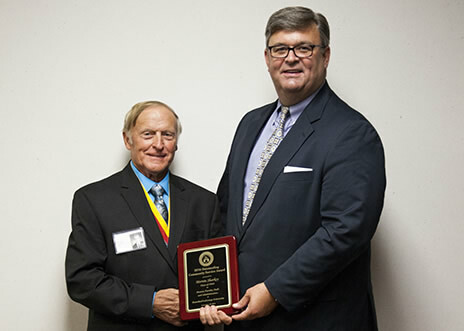 This award is given to a Hannibal-LaGrange graduate who has given outstanding service to the University or their community through involvement in civic endeavors, religious leadership, or philanthropic efforts. Born in Hannibal, Sharkey received his associate of arts degree from HLGU in 1963. He then went on to earn his bachelor’s degree from Northeast Missouri State Teachers College in 1965, and a Master of Arts degree from Truman University in 1976. Following graduation, Sharkey taught math in LaGrange, MO for four years. From 1969-1971 he served the US army in Vietnam. He then went on to teach math for one year at Fort Osage High School in Independence, MO, and for five years at Community R-VI in Laddonia, MO. For five years he served as head of the math department at Hannibal Public Schools before moving on to a guidance counselor position at Hannibal Middle School for 18 years. In addition, HLGU is proud to have employed Sharkey as an adjunct instructor of math for 22 years. 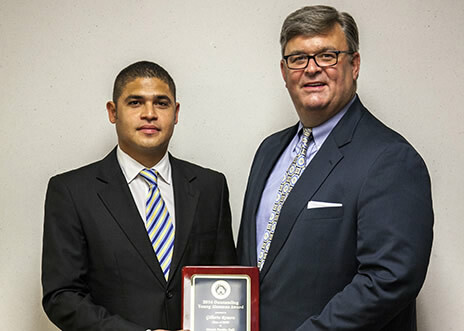 The Outstanding Young Alumnus Award was presented to Gilberto Romero Contreras ’08. This award is given to a Hannibal-LaGrange graduate, who is age 35 or younger, for outstanding accomplishments in their profession, business, community, state, or nation. Born in San Pedro Sula, Honduras, Romero received his Bachelor of Arts in Accounting from HLGU in 2008. Following graduation, Romero worked for two years as a staff accountant at Wade Stables P.C., Certified Public Accountants. In 2010 he transitioned to his current role as treasurer for Ayers Oil. Co. This past summer, Romero organized a ten-year reunion of HLGU soccer players that brought 15 alumni and their families back to HLGU. Participants traveled from Argentina, Brazil, Chile, Spain, Honduras, Panama, and across the United States to attend. 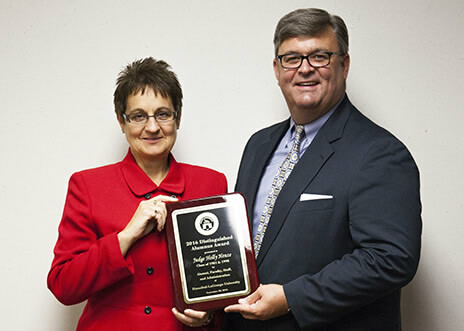 The Distinguished Alumnus Award was presented to Judge Holly J. Henze ’81, ’98. This award is presented to an HLGU graduate for significant and broad accomplishments in business or professional life, or for state or nation. Born in Quincy, IL, and raised on a farm south of Lewiston, MO, Henze received her Associate of Science in Secretarial Science from Hannibal-LaGrange in 1981. She went on to work for 14 years as a legal secretary at three different law offices in Canton, MO and Quincy, IL before returning to HLGU to earn her Bachelor of Science in Organizational Management through HLGU’s ADVANCE Degree Completion Program. She then worked for three years as a law clerk in Quincy while also working toward her Juris Doctorate, a degree she received in 2001 from University of Missouri-Columbia School of Law. Since earning her JD, Henze has worked as an associate attorney at Schnack Law Offices for two years, Adams County Assistant Public Defender for nine years, a solo practitioner for the Law Office of Holly J. Henze for eight years, an adjunct professor of Business Law for HLGU’s ADVANCE Program for three years, and Adams County Chief Public Defender for four years. In 2016, Henze was appointed Associate Judge for Adams County Circuit Court in Quincy, IL.